For 23cm I started out with ATV Amateur Television with a 24 element JVL design Loop-yagi antenna made from copper brake pipe and aluminium U section about 2m long. 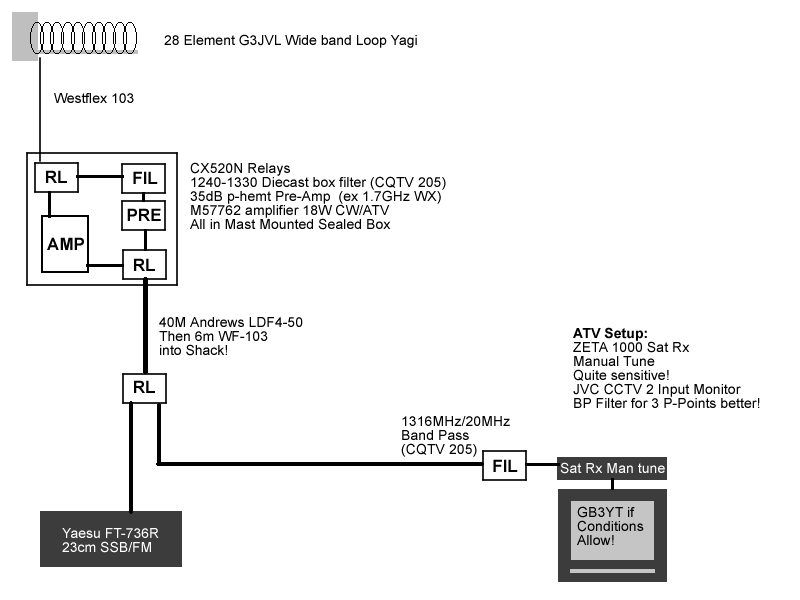 This worked very well for Receiving ATV and has a reasonable amount of gain, but I managed to get hold of 2x28 element G3JVL yagis off-the internet on G3CWI site including a 1W ATV transmitter. This was bought in dec 2003, the gear finally came in may 2004! The guy who I bought it off had some family problems and the gear was not one of his main priorities, all was ok in the end but I was about sick of waiting!. Anyway, these antennas were phased together and improved the 23cm setup dramatically and with the transmitter I could join in with the other local stations finally. Next on 23cm I bought a transverter from gm4wll, a kit made by DownEast Microwave in the USA. Now I could then hear the GB3MLE beacon over 80km away at S7 all the time, wnith the old homebrew atenna it is only about S1.